Whether you’re just starting pharmaceutical applications and are thinking ahead or you’re actually preparing for an interview you’ve got scheduled (yay! ), we’ve got all the information you need. Everyone finds interviews nerve-wracking. It’s even worse if you’ve not done one for a while. It’s probably no surprise that the better prepared you are, the more likely you are to be able to control those nerves. 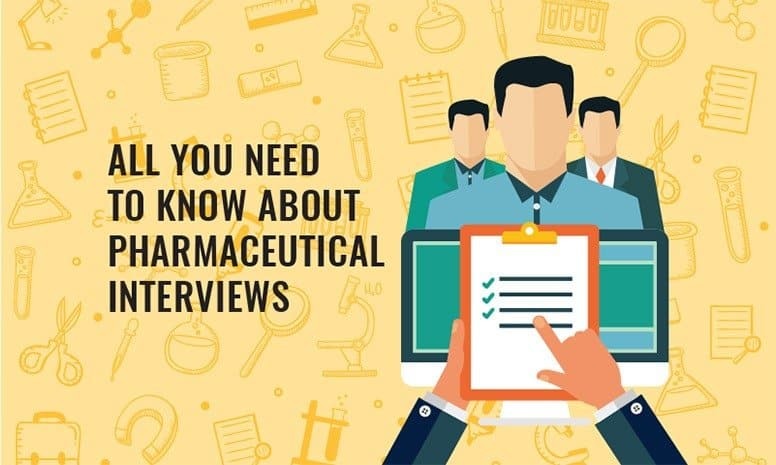 So in this guide, we’ve compiled all you need to know about pharmaceutical interviews. You can start at the top and work your way through it all, or you can use the links in the following contents section to jump to the most relevant area. Whether you’ve done 1 or 100, the process for preparing for an interview doesn’t really change. Interview preparation should fall into 3 categories – yourself, the company and the process. Use the information below and our “Interview, Now What?” template (linked at the bottom of the page) to help guide your preparation. You have to know yourself inside out. This sounds like common sense, but it’s often harder than it first seems. You have to be able to line yourself up against the job specification and critically analyze where your strengths and weaknesses are. Take time to think about (and practice) clear and concise ways to explain both. You also have to make sure you can comfortably talk through your work history. Stumbling to remember your own past doesn’t make a great impression and may even lead people to wonder how honest you’ve been. If you’re changing industry, it’s important that you not only tell the interviewer what your roles have been before but also how they gave you transferable skills relevant to the position you’re interviewing for. You may think it’s obvious, but there’s the chance your interviewer knows very little about your previous role, so spell out the similarities. Don’t leave them guessing. Additionally, you should be able to give a confident overview of yourself in 2/3 minutes, many interviewers use this as a way of beginning an interview and letting you settle down – be aware of what your key points are. (See more about this in the “Types of Interview Questions” section below). Before you set off for an interview, you need to gather as much information as possible. You have to be able to show that even though you’ve not done this specific role in this company or industry before, you have a good idea of what it is and what it involves. Have a look at the company’s website, social media (Facebook, LinkedIn, etc.) and talk to anyone who knows something about the company. What you’re after is a well-rounded view of the company, what they do and how they function. Not only does this help you look prepared and confident to the employer, it also helps you decide that this is a company you would enjoy working for. Asking what you know about the company is often one of the opening questions in an interview – take the opportunity to do more than just relay a list of facts. Tell them why knowing this makes you want to work for them, what makes you a good fit or what can you add to the pursuit of their company goals. You can easily use this question to get an excellent start to your interview. (Again, see the section below on interview questions for a more detailed discussion on answering this question). Are you only meeting one interviewer? Is there a set structure to the interview? Will there be any assessments or psychometric tests within this interview? How long is the interview scheduled to last? Preparing effectively will give you confidence going into that all-important interview. But even if you’ve asked all the above questions, expect the unexpected! Remember that no two interviews are ever the same and you can’t guarantee any part of it. Be sure to make the most of every opportunity given to you throughout the process and be clear on the key things you want someone to know about you. Every job selection process is different – you can’t just assume you’ll go for a face-to-face interview and a few days later you’ll hear whether you got the job or not. Companies use all sorts of techniques to ensure they pick the best candidate. If you know the process before you start then you’re in a better position to perform well. So what types of interview can you expect? Why Companies Do This: Telephone interviews are typically used as a screening tool. They’re a way for HR to assess a large number of candidates in a short period of time. What to Expect: Telephone interviews will typically be conducted by a member of the HR team (and not a line manager). They usually consist of a small number of set questions and are generally quite short. Don’t expect much of a conversation – the person conducting the interview is likely to stick to a script of pre-set questions and generally won’t ask any follow-up. You also won’t typically get any feedback on the call. It’s more likely that your success (or otherwise) will be determined once you’re off the call and you’ll receive further instructions a few days later. Competency-based questions are commonly used in this sort of interviewing – see the dedicated section below for information on how to answer these. Since a telephone interviewer is unlikely to probe any further than your initial answer, it’s important that you answer clearly and concisely but give enough detail to fully get your point across. Treat it like an in-person interview – some people will even recommend that you dress as if you were meeting the person. Whether you do that or not, it’s usually a good idea to treat it like the person can see you. Many things can change the tone of your voice and if you act like the person can see you then you’re most likely to project a professional and friendly tone. As an example – smile, especially when answering the call. It might sound silly but it will change the tone of your voice. Alternatively, some people will recommend standing during a phone interview as a way to keep yourself sounding alert and professional. Either way, it’s about finding the process that makes you feel comfortable and able to present yourself in the best possible way. Speak slowly, clearly and at a good volume. Make sure you’re somewhere quiet with good reception. Also, make sure you’re free from distractions – make sure others around you know you’ve got an interview and not to disturb you. Ask when you can expect feedback and what the next stage of the process is if you are successful. Why Companies Do This: Similar to telephone interviews, video interviews are typically used as a screening tool for a large number of candidates. What to Expect: There are different types of video interview – try to get as many details as possible from the company so you can prepare effectively. Sometimes you might speak to someone over a video call and sometimes you might be recording answers to set questions. For either type, you want to make sure you’re somewhere quiet, where you won’t be disturbed or interrupted, and where you have a good internet connection. If you’re speaking to someone then you should prepare and treat it as an in-person interview. If you’re recording answers then make sure you read all the instructions carefully and follow them. It’s more difficult here but try to imagine you’re talking to a real person who’s just being really quiet – remember that someone will sit and watch this, talk to them. Why Companies Do This: This is another screening tool used by companies to assess a large number of candidates. These are usually done as a second round of interviewing (typically after a telephone interview). Companies primarily do this to identify candidates that are the best fit against a particular set of criteria. What to Expect: Some psychometric tests are carried out online and can be completed anywhere you have an internet connection but often these are combined with in-person aptitude testing at an assessment centre set-up. The main thing to remember is that while you will be successful or unsuccessful at this stage of interviewing, it’s not really about passing or failing. These tests are typically assessing personality traits and specific skills. In tests that are assessing your personality type, answer honestly – if you’re a good fit for the company, that will be enough. This is genuinely the best idea and the thing most likely to give you a “successful” outcome. Do not to try to second-guess the “right” answer. You’ll typically be asked similar questions in many different ways. Trying to guess the “right” answer will generally lead to you looking inconsistent – this is a sure way to be marked unsuccessful. For tests of mathematical or language skills, a quick google search will get you some practice tests online. Some employers will also send a link to relevant practice tests – definitely make sure you complete any practice materials you are given. This gets easier the more you do it. You can’t ever know the questions but you can practice the technique so that when you’re in a stressful interview environment, you’re more likely to remain calm and focused. On the day, make sure you read all instructions carefully. It’s worth taking a little longer to read through things and understand fully. Trying to skim read and get to the questions quickly is likely to see you misinterpret or miss key points of information. Why Companies Do This: In person interviewing is the traditional method that most people think about when they consider interviewing. In the pharmaceutical and medical device industries, it’s typically used after some of the screening interview techniques outlined above. What to Expect: There are still a huge number of ways that in-person interviews can be conducted. Examples include 1-to-1, with a small panel of interviewers, with an HR representative, with the person who would be your line manager, conversational interviews or structured interviews with set questions and a marking system. The bottom line is that when you’re invited for an interview, you need to ask as much as you can about the process and what to expect. Top Tips: The main thing to remember is that if you’ve been called for an interview – someone has read your background and thinks you might be a good fit. Sure, there may be some underlying concerns they want to ask about, but they’re interested! The rest of this article is all relevant to in-person interviewing, so read on for all our top tips! What Interview Questions Can You Expect? There’s no way to know exactly what you’ll be asked, there are lots of ways they can ask you about your past work experiences and your reasons for wanting their job. But there are several interview questions that are asked so frequently, it’d be a mistake not to prepare for them. Some questions can be a little tricky if you’re unprepared. Asking difficult questions is a great way for an interviewer to see how you cope under pressure, and often more likely to force you into an honest answer. In a pharmaceutical or medical device manufacturing interview, you might be asked some technical questions. These will be at a level relevant to the job you’re applying for. If you’ve worked in the industry, these should be no problem. If you’re a GetReskilled student reskilling from another industry, you should revisit your course materials and your self-assessment questions as preparation for these. Technical questions are the main reason we recommend waiting until the end of your first academic module before starting applications. By the time you’ve finished your first module, you should have a good enough understanding of industry basics to be answering technical questions for entry-level jobs. Again, if you’re coming to an interview without any industry experience, the interviewer knows that so it’s not a dealbreaker. You just have to be able to show that you’re learning from your course and have a good theoretical understanding of the industry and the regulations in place. It’s helpful to think about non-technical interview questions in a few different categories (as we’ve done below). No matter what you’re being asked, it’s worth taking a second to consider why you’re being asked it. Time is of the essence in interviews – if an interviewer thinks a question is worth asking, there must be a reason. Your first impression. An interview will often begin with a question or two to break the ice – things that are easily answered and should put you at ease. But, as we discussed above, there’s still a reason for this. This is the time someone will be forming first impressions about you and the way you present yourself. In general, try to be friendly, positive, clear and confident. We’ve spoken in other articles about the need for a personal pitch. But it’s not just a nice way to introduce yourself at networking events, it’s also a great base from which to answer the often-asked “tell me a little about yourself” question. This question is typically asked at the start of an interview as a way to help everyone settle into the interview and provide a baseline of information from which the rest of the interview can develop. The interviewer is looking for you to give a brief overview of your work experience and/or academic achievements to date. They’re not looking for personal details such as your family circumstances. You should approach this question as a place to lay out your “Key messages” to the interviewer. What are the 4/5 things about your history that you think make you a good candidate for this role? If you’re coming to pharma from another industry – discuss your previous roles briefly but, as with your CV, try to keep the focus on the transferable skills you used/developed and successes you had. Don’t get into too much detail about the duties/responsibilities of your previous roles unless they are directly applicable to the role you’re applying to. If you’re taking a course to reskill into this industry (or have recently finished one), it’s worth highlighting this here. Similarly, if you have any hobbies, volunteering or non-work related experience that helps to demonstrate your suitability, you should mention them. Essentially, you should bring anything that shows you as a strong candidate to the interviewer’s attention during this answer. While this may be framed as trying to figure out what you know so they don’t waste time telling you it again, what they’re really looking at is how much you’ve prepared. It soon sorts out those who want “a” job from the ones who want “this” job. You should be able to give a concise answer to this. Faltering in answering this question is an awful way to start an interview and a terrible first impression to have to try to overcome. Luckily, it’s one of the easiest questions to prepare for and you can easily turn it into an excellent opportunity. Most companies have a website; most company websites have an ‘About us’ section. As an absolute minimum, you should know the content of that page. You can also look for the company’s presence on social media (e.g LinkedIn, Facebook, etc), as this will often give you big clues about their current strategies. Also, put the company’s name and ‘news’ into a search engine to see if there’s anything current you should know about. But once you’re in the interview, do more than just relay a list of facts back to the interviewer – take the opportunity to shine. When discussing what you’ve learned, you should tell them why knowing this makes you want to work for them, what makes you a good fit or what you can add to the pursuit of their company goals. You can easily use this question to get an excellent start to your interview – make sure you make the most of it! If you find information difficult to come by, tell the interviewer what you did to try to find out. In these questions, an interviewer is trying to get to know your CV and past experience. They are trying to get a more rounded view of you as a candidate and develop on what they’ve read on your CV. If an interviewer is asking specifically about a previous role, you should see it as an opportunity to show them similarities, not just relay facts. If it was within the industry – give an outline of your duties and responsibilities, paying particular attention to where you identified crossover with this current role (taken from the job advert). Try to have examples of successes and achievements that you can discuss. The easiest way for someone to imagine you being successful in their team is to hear about successes you’ve had in other teams. If it’s a role from another industry, give the interviewer a brief overview of duties and responsibilities within a broader context of the team/company goals. Remember that the interviewer might know very little about your previous industry to stick to simple, clear language and avoid jargon. Try to keep the focus on areas of similarity – in this case, that might be discussing transferrable skills that you gained or developed, rather than actual duties. Make sure you’ve considered all the transferable skills that your previous jobs developed in you to maximize the opportunity to show cross-over or relevance here. You should also be discussing any success or achievements you had in this role (for the same reasons outlined about). You should try to avoid gaps on your CV wherever possible. Make sure that you’ve included ALL work experience, academic experience and volunteering to create a full timeline on your CV. There may be instances where a gap is unavoidable though. If this is the case, it’s up to you whether you highlight and explain it on your CV or leave the gap unexplained. Either way (but particularly if you’ve left the time unaccounted for), an interviewer might well ask about it. If you’re in the situation of having a gap, you should be well-prepared for this. Have a clear and concise explanation for the gap – make sure you give enough information so the interviewer has a good understanding of the reason for the gap, but don’t give too many unnecessary details. If the reason for your gap is something that you think an employer might worry about, you might like to include a brief outline about why it shouldn’t now be an area of concern. For example, if you went traveling you might explain how that trip met your desire to travel and that you’re now ready to settle into employment again. You might also consider if your career gap helped to increase your skills in ways that you might not necessarily try to list on your CV. From the travel example, perhaps your communication skills or planning abilities are now more developed as a result. If so, you can highlight the points as part of your answer. Ideally, you’ll be able to show an improvement in an area that the role requires. If you can manage that, you can turn a potential area of concern into a positive in the mind of the employer. You should practice saying this answer out loud before your interview. A short but factual account delivered in a confident way is the best way to address this. Actually saying it out loud a few times means that your delivery will be confident and you’re much less likely to start rambling in an interview situation. Competency-based questions are a very specific type of interview question and they are EXTREMELY common in pharmaceutical and medical device company interviews. You should definitely prepare for answering competency-based interview questions. Competency-based interview questions are a way of assessing candidates across a level playing field by asking about your skills and experience with a range of competencies. They allow direct comparison of candidates, even those with wildly different backgrounds. The good news is that competency-based interview questions and their answers follow a very specific format. The bad news is that if you’re not prepared for this format, you might not give the interviewer the details they need to score you properly. This can lead to a poor outcome. Just because you didn’t frame your answer correctly. So what is the format and how do you maximize the opportunity of competency-based interview questions? The question will typically follow a format of “Tell me a time when…” or “Can you give me an example of a situation where…”. What follows will typically be about a transferable skill or competency. When you answer, you should use the STAR format of response. STAR stands for situation, task, action, result. Situation – a brief overview of the general context of the example. Task – a breakdown of the problem, project or circumstance explaining what was required of you. Action – what you specifically did within the setting. Result – what the outcome was. Before you go to an interview, think of examples that demonstrate common competencies. You should pay particular attention to any competencies or transferable skills mentioned in the job advert. List out a couple of examples for each competency. You generally can’t use the same example for more than one question but you’ll often find that an example might fit more than one competency so it’s best to have a “back up” for each category. Give a specific example. People often get caught in the mistake of talking generally about using a competency within a previous role. Instead, try to explain a very specific time, situation or instance where you demonstrated the competency. For example, rather than talk about how teamwork was always important because you worked in a team of 6 people and had to work together, give an example of a specific situation that required you all to work together towards a common goal. Really listen to the question. Don’t get caught giving a generic answer about a competency if there’s a twist/nuance to the question – that’s just as important. And if you’re using an example that fits more than one competency, make sure you’re really tailoring your answer to highlight the specific competency being asked about. If the outcome for the example was based on team efforts – make sure you focus on the things that you specifically contributed. You should be using “I” a lot in your answers. You need to highlight to the interviewer exactly what your role was in the example and the actions you took. Be careful not to talk about a team (or “we”) too much. Be clear about results – give as many details (facts, figures, percentages etc) as you can. Being specific really helps to solidify successes and give examples more impact. In the results portion of your answer, you might also discuss what you learned from the experience or anything you would do differently next time. As the interview is coming to a close, there are a few questions you might be able to anticipate as “wrap up” questions. These can often represent a change in tone of the interview and are a great place to ensure you leave a lasting good impression. Hopefully, this is something you’ve given some thought to so it shouldn’t be too difficult to answer! BUT people often make a mistake here. They’re quick to start listing out all the reasons that getting that job would be good for them. What you might consider giving more weight to, is why you getting that job is good for the employer. A focus on things such as your skill set being a good match, you being extremely motivated for a new challenge, having a strong desire to join a company with their ideals where you can build a long-term career. These are all reasons you’d want the job. But they’re also reasons that are encouraging and beneficial to the employer. This is a place you can really set yourself apart from other candidates. I hope you do! You’ll almost always be asked this at the end of an interview and it’s considered best practice to have something prepared. The safest way to do this is to prepare 5-10 questions as part of your specific interview preparation. Go through the job advert, is there anything you’re unclear about? When you researched the company, was there anything you couldn’t find an answer to? Keep the focus on trying to show you’re genuinely interested in the role and how you might succeed in it. Don’t just prepare basic questions about the functions of the role (e.g. what shift pattern would I be working?) – these things will typically be covered by a good interviewer. Look to show that you’ve given things more thought than that. If all you’ve prepared are questions like this, it’s extremely likely that you’ll get to the end of the interview and find you have nothing to ask because they’ve all been covered. Ideally, you want questions that are “open”. Open questions typically start with words like What, Why and How. They cannot be answered using yes, no or one-word answers. Don’t ask about salary, benefits or perks – while these are all things you’d definitely want to know before you accepted a job offer, they’re things that are better left until a second round interview. Try to keep a positive focus – don’t ask about negative things such as outcomes of poor performance, missing targets, not getting on with the team, etc. What does success look like within this role and how is it measured? What traits do your most successful team members share? What do you enjoy most about your role within the company? What does your ideal candidate look like for this role, and how do I compare? As well as fitting all the criteria suggested above, they’re questions that might actually offer you more of an insight into the role and what the interviewer is looking for. This can give you the opportunity to talk about your suitability in a way that you hadn’t known to do before. A few like this and you’ll definitely have something left to ask when the time comes. There are several things you can do to help calm your nerves and make sure your interview goes as well as possible. Print a copy of the CV you used to apply, the job advert and the interview prep form. Try to review these on the morning of your interview. When you’ve been applying for multiple jobs a week for several weeks, it’s easy to get details muddled. You’ve got to leave the employer feeling like this is the job you want, be clear on the specifics. Review what the key skills are that they’re looking for and their current priorities. Just as you tailored your CV to the jobs advert, you should be tailoring your interview answers to speak to their needs. Make sure you have a few great questions lined up to ask. When you interview for a job, it’s extremely important to look professional and polished. Although your everyday working attire may vary based on the position you’re applying for, you need to look well-dressed and put together for an interview, no matter what the company. In the pharmaceutical and medical device industries, always go with professional attire. Everyone knows that first impressions are very important – make sure you don’t make a bad first impression before you even arrive. Running late not only suggests poor time management skills, but it shows a lack of respect for the company, the position, and even your interviewer. Go the extra length to make sure that you aren’t late – in fact, aim to be early. Plan out your route to the interview location and estimate the time it will take at the relative time of day. Then always allow MUCH longer than that. Don’t be the candidate that’s late. Don’t even be the candidate that arrives in a hurry, on time. Be the candidate that’s sitting calmly in the waiting area for 10 minutes before their interview time slot. Introduce yourself pleasantly to everyone you meet. You have no idea who might be asked what kind of image you gave or impression you made. Once you’re in that interview room, the only things you should be thinking about are the questions being asked and your answers. Distractions come in many forms – there are some you can control and some you can’t. It is your responsibility to ensure you’ve dealt with all the ones you can control, both before you enter the room and throughout your time with the interviewer. Before you go in, deal with any outside distractions – switch off your mobile phone (or at the very least ensure it’s silenced) and clear your mind of any daily drama you might have had that morning. It can be really easy to anticipate what you think an interviewer is going to ask or what you want them to ask, and to answer that. Really listen to the question. Take a second to consider your answer and give it, making sure you address all parts of the question. It’s better to get clarification about a question before you start answering than being too afraid to ask and answering the wrong thing. It’s also worth considering this from the point of view of the employer – pharmaceutical and medical device manufacturing are heavily regulated industries and the ability to interpret and follow instruction is critical. You don’t want staff who misinterpret things and follow through on that wrong interpretation. You’d much rather someone double check if they weren’t sure. If you’re finding it difficult to stop your mind from racing and distracting you, try sitting forward in your chair and employ some good ‘active listening’ techniques. If you find that your interviewer is the one who seems distracted or disorganized then it’s even more important that you focus on making your ‘key facts’ heard and remembered. Having a clear idea of the process lets you confidently focus best on each task in turn with no surprises. Are they making a selection based on these interviews alone? Is there a second stage of interviewing? Are there tests/assessments to do on a separate occasion? As soon as is possible and convenient once you’ve left the interview venue, stop and make some notes. This insight will help you follow up with this interview but also helps guide your preparation for future interviews. And don’t leave it too long, your recollection of details will deteriorate quickly throughout the rest of the day. What answers went down well? What concerns do you think they have about you? Which questions of yours did they respond well to? Following up on an interview is something that most people neglect to do. Because of this, it gives you a great opportunity to set yourself apart from other candidates and leave a real lasting impression on the hiring manager. The key is to strike the right tone – you’re looking for friendly and professional, not desperate and pleading! If you’ve followed our advice then when you leave your interview, you know exactly when you can expect to hear about your success (or otherwise) in the process. If this time comes and goes and you haven’t heard, drop your contact another quick email politely asking for an update on the process timeline. And the final request you should have for every interview you do is feedback. Whether you ask for it in the interview itself or you ask for it when you hear if you were successful, it’s important that you come away from each application process with an idea of why you were or weren’t successful that time. Analyse your strengths and weaknesses for the role. Before the interview, take your time to work through the job advert again and identify the areas you think you’re strongest so you can emphasize them to an interviewer. But equally important is to identify the areas where you’re weaker, so you can prepare a succinct and effective way to address these concerns. Even if an employer doesn’t explicitly mention your weaknesses, they will have noticed them and may ask questions about them. Being acutely aware of what your weaknesses are, gives you the opportunity to spot when you’re inadvertently being asked about them and to confidently address them. It’s always worth remembering that one of the key outcomes of an interview, is for the interviewer to assess whether you could be successful in the position. The best way to do this is by showing them you have had specific and measurable success before. Wouldn’t it be great if an interviewer started the interview by telling you exactly what they were looking for in a candidate so you could be sure to show them that you fit the bill? They pretty much do. Think of the job advert as your cheat sheet for the interview – they’ve told you exactly what skills and qualities they are looking for. It’s unlikely that these will be reiterated in the interview process. Of course, your interview is a time to talk … appropriately. You may feel like you’ve got a lot to say and not much time to say it in, but talking too much really can harm your chances. Rambling can make you look disorganized. Keeping talking can make you look like you’re not paying attention or not able to respond to social cues. Talking about your personal life can make you look unprofessional. Listen to each question carefully and consider your answer – it’s better to take a second before you answer than start to answer and realize you’ve misinterpreted the question or not used your best example. When giving long and detailed answers, be sure to keep looking to your interviewer for clues that they’re looking to move on (e.g. Do they keep taking a breath to start to speak? Are they watching a clock?). Don’t feel rushed, just be aware when they are trying to move things along. Don’t ever get sidetracked and start talking about your personal life. Your spouse, your home life or your children are not topics you should delve into, no matter how warm and welcoming your interviewer may be. When you’re asked hard questions, like “Tell me about a time that you didn’t work well with a supervisor. What was the outcome and how would you have changed the outcome?” or “Have you worked with someone you didn’t like? If so, how did you handle it?” never fall into the trap of bad-mouthing other people. It’s sometimes a smaller world than you think, and you just never know who your interviewer might know. You also don’t want the interviewer to think that you might speak that way about his or her company if you leave on terms that aren’t the best. And, most importantly, it’s just not professional. Instead, review how to answer difficult questions. You want your interviewer to know that you can work well with other people and handle conflicts in a mature and effective way. If you have to explain a difficult situation, keep it factual. Keep the explanation as succinct as possible and focus more of your answer on explaining how you went about finding a solution. Keep it positive. The best advice is only to speak about people like they are in the room. It can be difficult to know what’s for the best – you’ve got to be careful that you don’t ruin all your chances by being seen as annoying with continued, unsolicited contact. Do try to avoid this headache altogether by agreeing on a plan for follow up whilst you’re still in the interview – ask when you should expect to hear, suggest that you’ll call on a certain day for an update if you’ve not heard. Interviews get easier the more often you do them. So even if you’re not sure you’d want the job, take the interview and use it as practice. Don’t see it as going into multiple rooms, reeling off the same information and hoping you find someone who likes it. See it as a process where you get better, take on feedback, learn from your own observations, and make each interview better than the one before. Turn every interview into a learning opportunity – even if you’re unsuccessful, make sure you’ve learned something. Be sure to ask for specific feedback about your performance. While most people focus on finding out what they did “wrong”, also take the opportunity to find out which things you did well so you can continue to develop them. Job hunting is a numbers game and interviewing is something you’ll have to become skilled at. It’s worth taking the time and effort to master basic interviewing strategies. Don’t find yourself “winging it” and “hoping for the best”.